Hello, and welcome to this 4th installment of Inside the Artist's Studio. 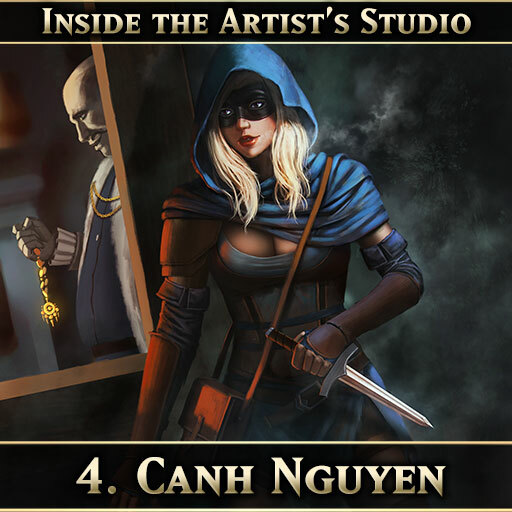 Today we have Rogue and Priest artist extraordinaire Canh Nguyen, creator of Grave Robbers, Zailen Scholars, Rabble Rousers, and of course everyone's favorite Shadow Era married couple, Vera and Ergon. Q. Tell us a little about yourself, such as your name, where you're from, and your age if you like. - Hello everyone, my name is Canh, I am a 29-year-old digital artist from Vietnam. Q. When and how did you start in art? - I’ve loved drawing since I was a little boy. I still remember the memory which brought me to this special hobby. I had a friend who was pretty good at drawing. One day, he showed me a drawing of a famous manga character at that time and challenged me to do it myself. I then started drawing frequently until the end of my high school. However, I did not seriously pay much attention to drawing. My drawings at that time were just simply a sword or a favorite manga character. After entering the university, I suddenly quit drawing completely. - At the end of 2015, I found out about the Pinterest site. Since then, I have spent a few hours to enjoy the artworks of artists around the world, which reminds me of my childhood. I decided to quit my job and started to draw again. I bought my first Wacom and went to some basic digital art classes. So far, I have been doing digital art for nearly 3 years, which includes 1 year learning myself and 2 years in freelance. - I drew a still life painting by pencil when I was in high school. At that time, although I had too much free time for drawing, it is regrettable that I hadn’t learnt about color such as water color painting or oil painting, which was also one of my biggest regrets. I only learn about how to use color when I start learning digital painting. So far, I have been mostly doing digital ones because it saves me a lot of time when I can do whatever I like and then still be able to fix my work. - Last year due to my limited experience, I could not get the job related to famous card games. However, I started doing my freelance in many upstart games such as THEA 2: THE SHATTERING of Muha Games in which I illustrated 10 characters. This game is also released in PS4. Q. What hobbies/recreational activities do you take part in outside of art? - Playing games, playing with cats, enjoying music and delicious cakes. Q. Describe creating each artwork. Gondorian (Ian) gives you some sort of general idea of what he's looking for I assume. How much do you go by his description and how much is your imagination? - First of all, I would like to express my sincere thank you to Mr. Gondorian (Ian) for giving me this job, which helps me improve and be more confident. - As regards the work, the ratio is even, 50 percent. Sometimes, he lets me decide on my own. Although my sketch is not good enough, fortunately he still understands and trusts me. Working with Shadow Era team is very comfortable and interesting, which is a perfect start for me to keep improving my experience. Q. What devices and software do you use in your work? - About my device: At first I bought Wacom Intuos 3, then switching to Wacom company 2 (which was similar to a tablet) so that I could freely work outside. -My most favorite phase is planning out a concept. This is when I apply new skills into my artwork. I am even happier when it succeeds. Q. About how long does each Shadow Era artwork take to complete? - I don’t count precisely for each work. My pace fluctuates a little bit. This is because depending on each work, I need to find the most efficient method. Sometimes, it takes time applying a new skill in my work because I don’t always succeed at the very first trial. Thus, I hope that you would be patient when I take more time than usual to finish the work. -I can draw anything you can imagine in fantasy themes but sci-fi themes. However, I would learn more about this topic if my work requires. - I still haven't got a chance to see the whole artwork of Shadow Era. However, if you’d asked me, I would choose the artist Thien Nguyen which is also my first teacher in this field. He's really good teacher, I have learned from him a lot. Q. Where can people see more of your work? Last edited by Gondorian; 03-26-2018 at 12:45 PM. Another super interview. These have all been very interesting to read and will be personally useful for connecting even more with the artists. You don't often get to find out this much about someone who is doing contract work for you! I've already since found out Canh loved The Green Mile too. Quite the Tom Hanks fan. Huge thanks to tman507 for firing the questions and posting the articles.